The Securities and Exchange Commission told a New York judge that she should be able to decide whether Tesla Inc. CEO Elon Musk violated the terms of his settlement with the regulator and whether to punish him for that without holding a hearing "because there are no material issues of disputed fact. The SEC wrote to Judge Alison Nathan on Monday to say there is no ambiguity to the terms of the settlement and that Musk tried to muddle the matter with "selective omission of certain settlement communications" in his filing Friday defending his actions. The SEC offered to provide more written information on the settlement negotiations if Nathan decides she needs additional information. 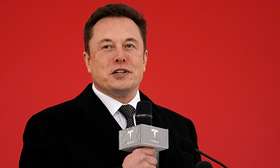 The October agreement ended an investigation into Musk's statements on Twitter about taking the company private, and required him to obtain preapproval of communications that are material to Tesla. He tweeted a Tesla production forecast for this year in February and corrected himself within a few hours, prompting the SEC to ask that he be held in contempt.